Many organizations have fantastic programs and starter kits that attempt to help people transition to a vegan diet. While the methods are absolutely tried and true, and have been used to help numerous people, I can't help but wonder if something gets lost in translation. Read: beans, kale, quinoa, cous cous, beet salad... Those words would make most people's head spin and their stomachs growl for more. Obviously many of the programs address specifically the health aspect of the vegan diet -- and while I think that is an awesome bonus, a vegan by definition follows a plant-based diet due to not wanting to exploit animals in any way. While I totally would love to help everyone become healthier, I really want people to stick to a plant-based diet to reduce the animal suffering in the world. Therefore I (and the TDIV team) have come up with an idea: Let's create a realistic guide to going vegan. 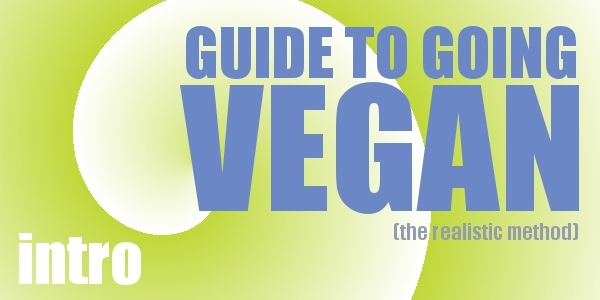 A guide that presents veganism in a manner that people can stick with for longer than a few weeks. No worries of whole-grain breads, no kale smoothies, no meals with ingredients you can only find at herb markets in far-away lands. Just good, stick-to-your-ribs food that happens to be plant-based. And guess what ... we'll use oil! I know, it's a bad word in the world of health but, in moderation, you'll be just fine. The other thing we'd like to show is that it is possible to be healthy, eat well and follow a plant-based diet without spending a ton of money. My family of five eats very very well on $125 a week. Yes, you read that right! And that figure covers our (all-vegan) breakfasts, lunch and dinner for the entire week. It's not necessary to break the bank. This guide will help open the door to a whole new world of food while allowing you to live a compassionate (healthy) lifestyle. In the beginning, you may not receive an award from Dr. Health Nut, but it's a great start and, of course, once you are comfortable with the transition, you can begin to mix in whole foods, lesson your oil intake and start experimenting with those funny foods vegans like to tout. Over the next few days, we will be compiling a shopping list and menu to get you started. So check back for updates. Oh -- we don't have any fancy sign up forms, but if you like the idea and think you may participate, head over to our Facebook page and give us a thumb up! And, if you are a vegan with some great menu ideas that fall in line with what's been explained above, shoot me an email. Greenville, SC Daelyn is the co-founder and managing director of This Dish Is Veg. She handles the daily operations of the site including advertising, story idea generation, and website promotion as well as managing the volunteer contributors. Along with her work at TDIV, Daelyn is an editor for a gift-giving website and mother of three daughters.